Tim Jones’s book on Don Kenyon, a Worcestershire stalwart and highest run scorer for the county, is a welcome addition to cricket literature. As well as scoring more than 37,000 first-class runs, Kenyon was also an England selector during his playing days. His position was valuable as he came across many of the players whilst still playing himself and was on the selection panel during the Basil d’Oliveira – a Worcestershire player at the same time – affair in 1968. Don Kenyon His Own Man is, though, much more than a biography of Worcestershire’s leading run scorer. Tim Jones has been a lifelong supporter of the county and his fond memories come over impressively and it can be counted as a record of Worcestershire cricket during Kenyon’s extensive playing days. There are a lot of match facts and reports but one also learns a lot about players of Kenyon’s era. There is, of course, decent coverage of Worcestershire’s back to back Championship victories. Kenyon is portrayed as not only an impressive cricketer but a man who was respected both on and off the field. He became a popular figure as Worcestershire President and was always on the side of the cricketer. The majority of the photos come from the personal collection of the Kenyon family and the book is liberally enhanced with such photographs. Kenyon may not have enjoyed the most fruitful Test career but, for those whose memories extend back to the 40s to 60s, his is one of the most recognisable names. 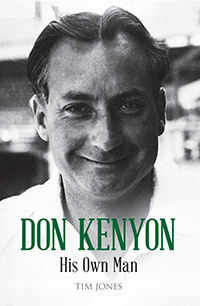 Tom Graveney, a team mate, may be one more in the public mind but Don Kenyon was one of the great names of Worcestershire cricket and this book is a handy book to find out more about the player and the county.